As a professor myself, I can say no one would have a beer at lunch before facing a class of sharp students, and I’m sure faculty members at UCSF don’t either. Is there anything wrong with another mall? Consider the impact on the rest of the community. The Mission Bay project is huge. Its area is 303 acres, about 20 percent of the entire area of District 6. Mission Bay residents will comprise an increase of 14 percent of District 6’s population based on the 1990 census, and an increase of 67 percent of the number who voted in the 1998 elections. If these new residents all vote, they will make up 40 percent of the electorate, assuming the same voter numbers in the remainder of the district. The displacement caused by Mission Bay will be enormous. Even though the project will house 10,000 residents, 30,000 new jobs are projected. That leaves a shortfall of 20,000 people who must live outside the project and commute into it each day. Some of these 20,000 will already live nearby. But most don’t. The "new high-paying jobs" created by the project will likely bring people with skills, cultures, and income levels quite different from those presently living in nearby SOMA, Potrero Hill, and the Inner Mission, bidding up rents and real estate. These neighborhoods are already sites of strong anti-displacement protests. The displacement will surely propagate through comfortable South Beach, too. The burden of 20,000 commuters going to and from Mission Bay each day is not clearly within the capabilities of MUNI even if expanded as planned. If one car carries, say, 100 people, then 200 cars are needed. That's about one per minute during a three-hour rush hour. The under-capacity of MUNI would force many to drive, adding to the already impossible SOMA traffic gridlock. Really? Genetic rules that govern behavior? This activity will not be as innocent as the web pages designed by SOMA’s dot.com’s. Imagine how nearby fenced-out, displaced, and gentrified communities will react when the first reports appear of escaping genetically modified organisms. Some neighborhood friends might come in handy then. Yet this project offers little friendship to the community. It’s simply a “Castle on the Marsh” whose design invites never-ending town-gown hostility. The essentials of the Mission Bay project are a done deal. What we're looking at now is mitigating its huge impact on the rest of District 6. Zoning must be sought to allow for construction of additional housing in District 6. Otherwise as many as 10 percent of the current residents of District 6 will be displaced from the impact of the Mission Bay project alone. 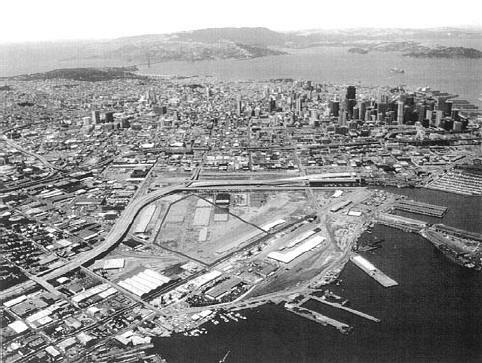 In the meantime, it is vital to pass Proposition L to limit commercial expansion in SOMA so that the expansion can take place in residential construction instead. While it might be argued that slowing commercial expansion will dampen economic growth, the civil unrest that will result from continuing unchecked displacement of people from their housing will be even more costly. Piers 48 and 50, which the mayor has just put on the auction block, are located at the Bay between the PacBell Stadium and the Mission Bay project. I suggest that they be allocated for a large plaza for community facilities — from space for truly affordable housing, artist cooperatives, covered booths for farmers’ markets, to a soccer field. Such a proposal has to be competitive with its present commercial uses, and with alternatives such as the mayor's plan. It has to express a vision that can interest financial sources with pockets as deep as a Texas developer’s. I suggest therefore that the plaza be named “Diversity Plaza” and that it contain a large statue to be called the “Statue of Diversity,” which would be to the West Coast what the Statue of Liberty is to the East Coast. The statue would affirm our neighborhood as home to all people, to people of all colors, cultures, genders, sexualities, spiritualities, ages, and states of health. America needs these! A Statue of Diversity could motivate support throughout America the way the Statue of Liberty did over a century ago. In this way, we could be genuinely proud of the Mission Bay region of our city. Joan Roughgarden is a candidate for supervisor in District 6. A longer version of this article appears at www.joandistrict6.com.